PETER FISCHL | ONE MAN. ONE POEM. ONE MISSION. Peter Fischl was a young boy when Hungarian Jews were being rounded up and killed during World War II. Unlike his father, and millions of others, Fischl survived.In the 1960s, now living in the United States, he saw a powerful picture in Life Magazine, taken of a young boy in the Warsaw Ghetto in 1943. The boy epitomized fear, as a German soldier stood behind him, rifle at-the-ready. The photograph haunted Fischl for years, reminding him of what his fate could have been, when he was about the same age as the boy in Poland. 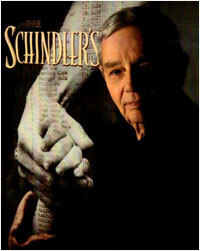 One night, in 1970, Fischl stayed up all night and wrote a poem, which he called: “To the Little Polish Boy Standing with His Arms Up.” Then, in 1994, Fischl was inspired by the movie Schindler’s List, motivating him to retrieve the old poem from his desk drawer, where it had been collecting dust for 24 years. The retired printer had generated millions of pages of words during his career, but this was the first and only time he had been moved to create and distribute his own work. He used the poem as a personal form of therapy, as well as a vehicle to educate children and adults around the world about the horrors of the Holocaust. 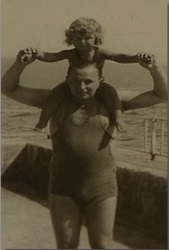 1934: With his father Tibor, a decade before Tibor would be killed by the Nazis. 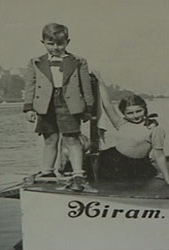 1938: With his sister Markia in Switzerland. Before 1944, the Fischls enjoyed a privledged life, thanks to their father’s successful business. 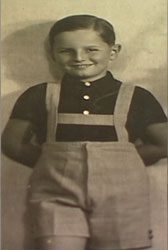 1940: Little did 10-year-old Peter Fischl know what lay ahead for his family and all European Jews.